The drumbeats of war are growing louder. Fighting in eastern Ukraine between separatists and pro-government forces has risen to an intensity not seen in well over a year, and the Russians claim that they recently foiled a “Ukrainian plot” to conduct terror attacks in Crimea. 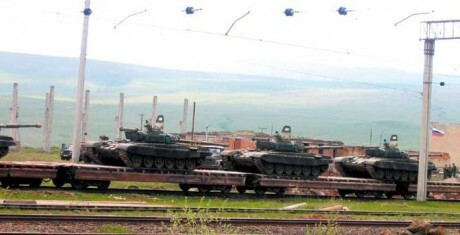 As tensions in the region have increased, the Russians have used the cover of “military drills” to move massive amounts of troops and military equipment up to the border with Ukraine. This is something that I wrote about a couple of weeks ago, but things have intensified since then, and a huge military exercise is planned for September. Needless to say, the Ukrainians are quite alarmed by this, and Ukrainian President Petro Poroshenko is warning that a full scale mobilization of the Ukrainian military may be needed. If something is going to happen, it is likely to happen soon. As you will see below, once we get into October it will become much less likely that we would see a Russian invasion of Ukraine. Ukrainian President Petro Poroshenko has even warned that there is growing risk of a “full scale Russian invasion along all fronts,” ratcheting up what is already the bloodiest European conflict since the wars over the former Yugoslavia in the 1990s. Continue reading at The Economic Collapse Blog: Winds Of War: Is Russia Conducting A Massive Mobilization Of Troops For An Invasion Of Ukraine?